With the top speed deficiency of the Parillas against the opposition as clearly demonstrated at Solitude, and the 250 engine failure first time out on a World Championship G.P circuit. Vic and I were very anxious as we set off for the Sachsenring knowing we had yet another World Championship meeting to contend with before we would be returning to the UK at the end of the month, to prepare for the Ulster GP. To ensure we would arrive in time at the Sachenring for registration and the free practice sessions, we had to drive for two days and all through the night and then only just made it. Again being delayed with the usual visa and customs clearance problems associated with crossing the infamous Iron Curtain. 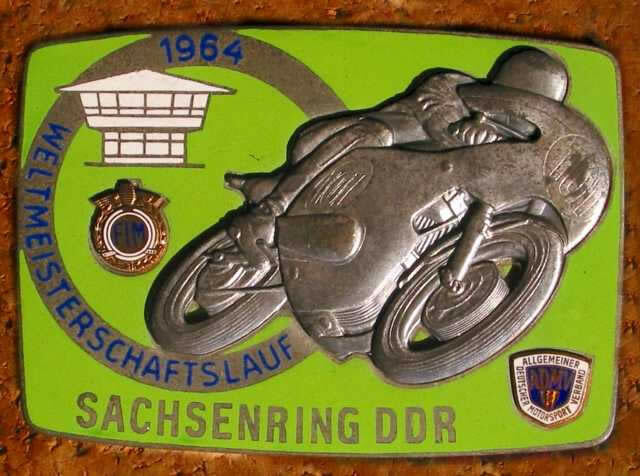 The 8.7km Sachsenring, a public road in 1964, running through the village of Hohenstein-Ernstthal, near Chemnitz, Germany, was a real road race circuit and the favourite of many Continental Circus riders. After only 2 or 3 laps of the circuit in our Ford Thames on the evening of our arrival, I had the feeling we might be more competitive here than at Solitude. delighted and relieved when my practice sessions went well, qualifying in the 3 classes – was lady luck beginning to smile on us once again? We discovered this was not altogether the case when we were informed by the race organizers, a visiting FIM representative from Switzerland, had objected to me starting in all 3 races as he claimed, I could exceed the total time permitted for a rider to race on any one day – I had not heard of this rule before! As a result of this intervention I was struck off the starting list for the 250 class race, the class in which ironically, I had achieved my best qualifying practice result of 17th place. The organizers did, however, agree that as I had officially qualified, I would still receive the start money they had offered for all 3 races. The above was the official explanation given to us for why I was being struck off the 250 starting list. 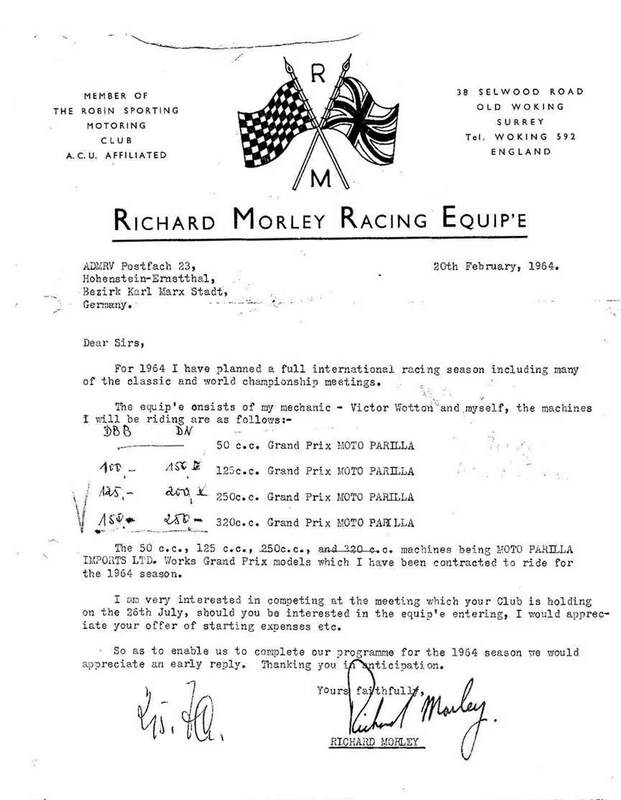 Within hours, however, we were to hear a rumour circulating in the paddock that I had been struck off as a result of MZ making a last minute entry application for Mike Hailwood to ride one of their Works bikes, in addition to Alan Shepherd and the two East German Works riders, they had already entered for the 250 race. Well what could we do? 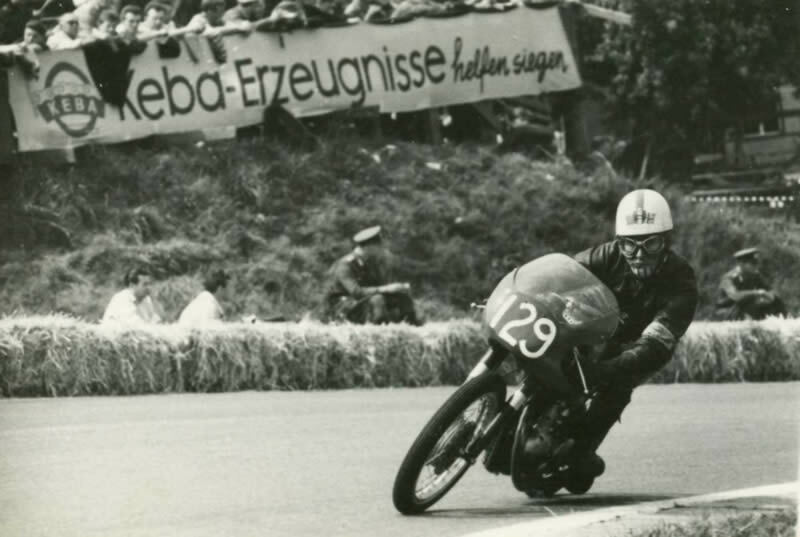 MZ were the top East German team and it was Mike Hailwood. 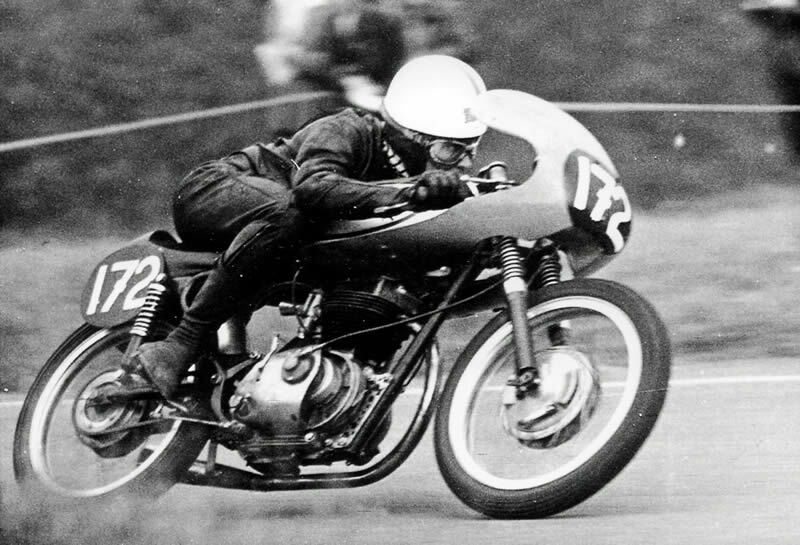 Mike had also won the 250 races for MZ in the previous two years. We soon came to the decision to just take the start money for the 3 races and not take the matter any further. The following morning we were preparing for the 125 race when again, along came one of the organizers, to tell us that if one of the riders in the races preceding the 250 race fell off and could not start in the 250 race then I would be substituted to take their place! what next? there was no mention of the FIM’s representative’s earlier ruling on this matter! 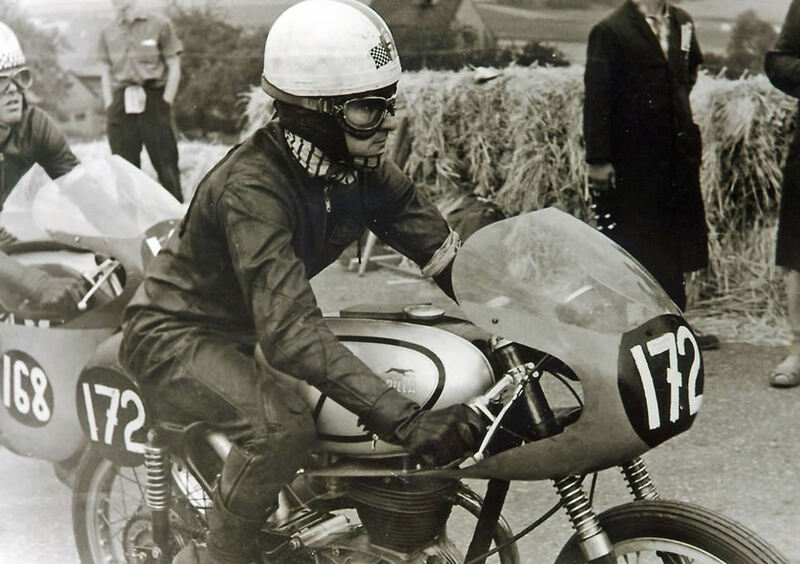 RM and Vic Watton waiting to see if Richard will start in the 250 raceAs it turned out I did not get to start in the 250 race and Mike Hailwood crashed out heavily on the 3rd or 4th lap having just set a new lap record when taking the lead from Phil Read and Jim Redman. Putting aside the politics which regrettably sometimes come into motorcycle racing, I was optimistic and looking forward to the 125 race as we all gathered in the pre race assembly area. Although I was way back on the 5th or 6th row of the starting grid, I was in the middle of a group of 7 or 8 riders all with very close practice lap times. 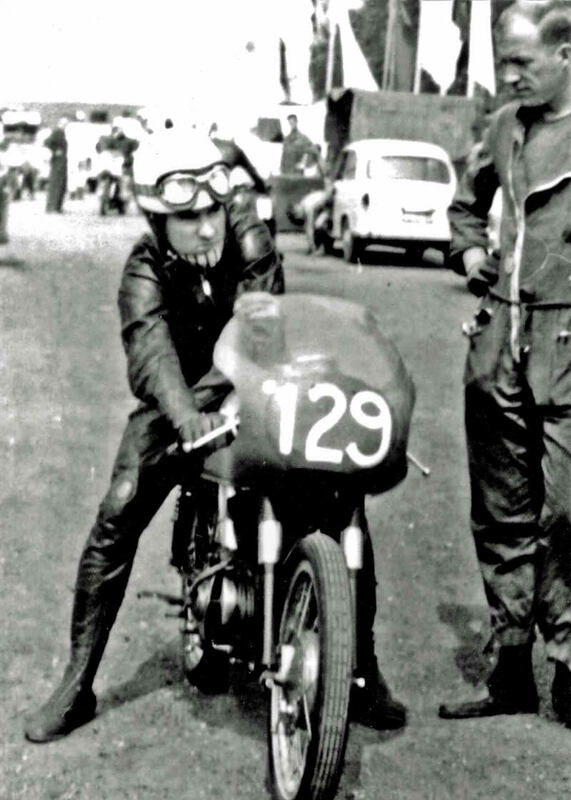 Our times were way off the times achieved by Hugh Anderson (Suzuki) Taveri, Redman and Beale (Honda) and Rosner (MZ) on their Works machines; it was as if these guys were in a race of their own! With yet another fast start on my Parilla, I had a number of good opportunities to get some useful tows down the longer straights during the early laps, behind the faster riders I had initially over taken at the start, as they came through the pack and then overtook me once again. Scheduled to be a 15 lap race (approx 90 miles) for the Works riders which would result in there being only 13 or 14 laps for us privateers. 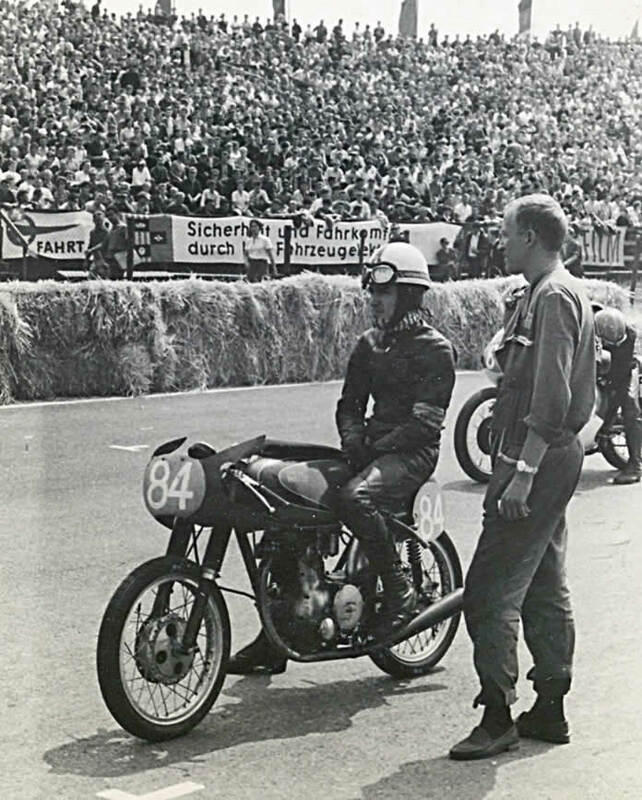 RM on 125 Parilla moving up to starting grid with Gerald MacDonald, Bultaco. After the excitement of the start and the first lap dash, things settled down and I was not surprised when after 9 or 10 laps into the race, to see the spectators (all 150,000 of them)! start standing up and looking in the direction behind me. A clear indication I was about to be lapped by one or more, of the race leaders. As I changed down for the next bend I heard a buzz from behind which could only have come from a Works Suzuki. On cue, Hugh Anderson went past as we came out of the bend and he soon disappeared into the distance at an alarming speed. Seconds latter with another warning from the standing spectators, Luigi Taveri passed just as we were approaching a left hand bend which, on the Parilla required me to shift down one gear. At this point as we were both preparing to take the bend and I was right up behind Taveri hoping to get a short tow from him as we came out of the bend when suddenly he appeared to miss a gear, or find a neutral. He immediately slowed and I had to dive under him at the apex of the bend to avoid running into him. This must have been the only occasion when the World Champion Luigi Taveri was overtaken by a Moto Parilla! Having sorted out his gears, Taveri shot past me. With only 1 or 2 laps to go to the finish, I looked back over my shoulder to find the American rider Gerald MacDonald and another Bultaco rider, tucked right up behind me. The sight of these guys closing in inspired me to keep going flat out until the end, taking 20th place and succeeding in collecting my first finishers award in a World Championship race. Gerald MacDonald finished right behind me, but I do not know what happened to the other Bultaco rider as he disappeared on the last lap. The 15 lap race was won by Hugh Anderson on the Suzuki in 51 minutes and 06 seconds, at an av speed of 152 km/h followed by Taveri, Redman, Rosner, Kohlar (MZ) and Beale. – 23 riders finished the race. Getting a great start in the 350 race in which there were fewer Works bikes, I was hoping to repeat my 125 race success but this hope was short lived when the Parilla lower clutch arm adjustment screw began to unwind and I began to loose the clutch. As a result I could not change any gear with confidence and decided it was better to retire rather than run the risk of crashing or even worse, taking another rider out. 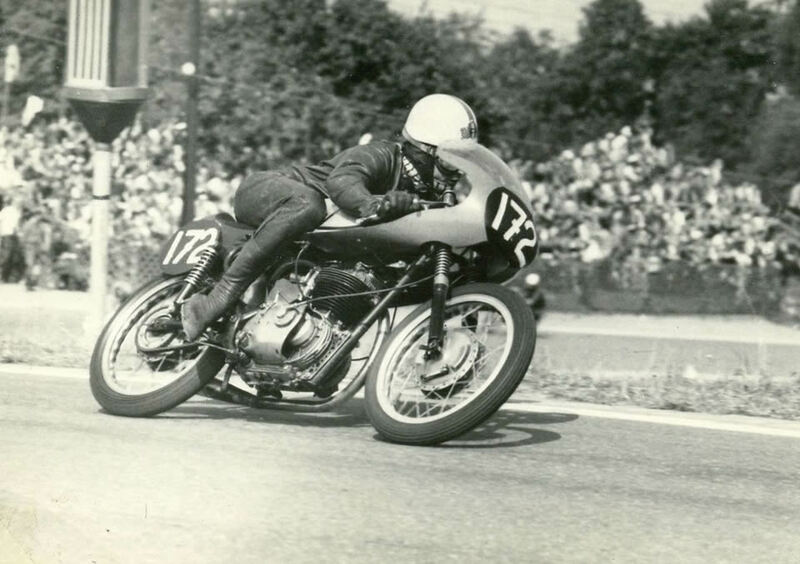 The 18 lap race was won by Jim Redman on the Honda in 59 minutes and 42 seconds, at an av speed of 156 km/h, followed by G Havel (Jawa) Mike Duff (AJS) Beale (Honda) Vernon Cottle (AJS) and Fred Stevens (AJS) – 16 riders finished the race. True to their word, the organizers gave me my full start money entitlement and awarded me with two finishers’ awards, not with standing my early retirement from the 350 race. It was now time to pack up and get ready to return to the UK.